It's a cold, rainy day here in New Orleans -- but that didn't stop all of the city's major TV networks from coming to our press conference to release our new report on Hurricane Katrina and global human rights (you can download the full PDF here). The media event was held at the offices of Advocates for Environmental Human Rights, a group pushing the U.S. government to more faithfully comply with U.N. standards for responding to disasters, particularly the Guiding Principles on Internal Displacement. As we extensively document in our report, the U.S. response to Katrina breached many U.N. human rights principles. Perhaps most importantly, it's still failing to live up to the standards -- for example, by failing to prevent future displacement (the levees still aren't 100%) and help those still displaced by Katrina (remember the battles over public housing?). Also on hand at the press conference was Walter Kalin, a top U.N. official from Switzerland, who forcefully argued that the U.N. Guiding Principles are still deeply relevant to Katrina victims. The reporters asked a lot of questions, and seemed genuinely intrigued to learn that -- perhaps with appeals to Washington and Baton Rouge feeling increasingly futile -- the residents of New Orleans might have a case before the world community to confront the ongoing Katrina crisis. But what does it all mean? they wanted to know. Does the U.S. care what the U.N. thinks? 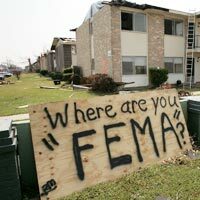 What can a family still trapped in a FEMA trailer do with this information? Appeals to the world community can have impact -- think of the civil rights movement in the 1960s. But the real issue raised by our report and Mr. Kalin's visit to the Gulf Coast is the need to reform U.S. disaster law, especially the Stafford Act. Currently, officials have almost complete discretion in how they respond to disasters, and there are no clear standards to ensure the rights of those uprooted are protected. One can only speculate: if the steps and standards outlined in the U.N. Guiding Principles -- which the U.S. embraces and promotes in other countries -- had been U.S. law when Katrina struck, how much of the hardship could have been avoided? That's the message of our report, and Mr. Kalin's visit -- not only to New Orleans, but the rest of the country: know your rights when disaster strikes. And get your elected officials in Washington to put these globally-recognized standards into law here at home, so the next disaster doesn't become another Katrina tragedy.